We see lots of people with health issues that are related to cigarette smoking. The link is serious enough that we'd like to devote a little more time to this topic. Smoking cessation is extremely difficult but presenting accurate information might provide the motivation to stop. Smokeless tobacco is linked to cancers of the mouth, lip, tongue, voice box and esophagus. It irritates the gum tissue and can result in gum disease. Additives can increase tooth decay and wear down the teeth. Smokers are still less likely to visit a dentist for an existing problem than nonsmokers or those that have stopped smoking. In fact, smokers are twice as likely not to have been to a dentist in over five years. Some don't ever go to the dentist. People who smoke may struggle with the cost of health insurance and dental treatment. But preventive dental visits not only save lives but save money in the long run. With early detection we can often resolve issues before broader health complications develop. Please encourage the smokers in your life to make a dental appointment. It might be the first step toward smoking cessation. You may offer our contact information and our willingness to work out a reasonable payment plan for our services. Your good efforts could save a life. 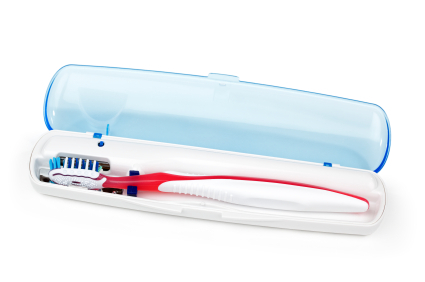 Is your family inclined to keep toothbrushes out in the open rather than tucked away in a drawer or cupboard? If so, they are likely to be more exposed to germs carried on the air or to microscopic particles caused by nearby toilet flushing. Anti-bacterial covers -little garages for toothbrush heads- are cheap insurance and especially useful for travel. Check out toothbrush sanitizers, too, a very easy-to-use product with antiseptic properties. In budgeting for your family's sports activities this season, we encourage you to include the purchase of a properly fitting mouth guard. Hard surface sports, contact sports, and even skateboarding and bike riding can result in broken teeth. Inserting a mouth guard becomes as routine as suiting up or grabbing the bicycle clips. Start this safety habit at the beginning of the season and save potential tears and expense later. Call us if you need more information. Copyright © 2010-2012 Henke & Okerstrom and WEO MEDIA. All rights reserved.